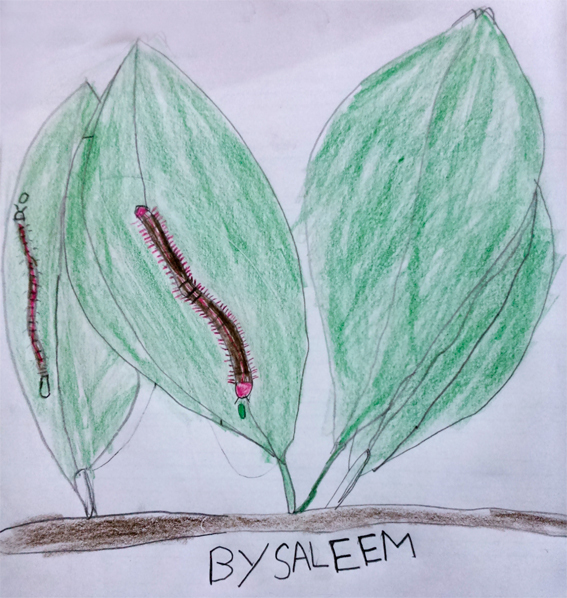 Chapter 1 – So many living things! a house spider, above a tubelight that was fixed to the wall. The spider was hanging upside down high above us, close to the ceiling. 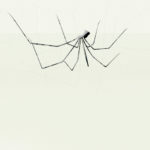 It had a small body with eight long thin legs gracefully arched around it. What was it hanging from? We could not see, but we guessed that there must be a fine, silky web, invisible to us as it was too fine and too high up. Near the spider, stuck to the wall and to the tubelight holder, were a few dusty-looking clumps of cobweb. Perhaps they were old and damaged cobwebs, abandoned by the spider before it spun its delicate new web. Earlier in the class Abdul Malik mentioned that he had seen black cobwebs. They must have been old cobwebs like these, which easily gather dust as they are so sticky. Fahmida said she had seen a fly trapped in a spider’s web. a hunting spider – it was darting around on the garden wall, right behind the bamboo plants. 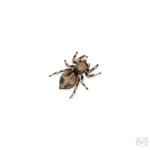 Coloured dark and light grey-brown, it had eight legs, which were thicker and shorter than the house spider’s legs. It had a small pair of claws which it moved together and apart continuously. Was it scraping the damp wall with its claws, checking for any insects there? 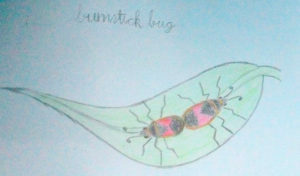 many red-orange bugs with back spots – they were scurrying among the bushes and over rotting pieces of bark on the ground. Many were stuck together at their ends but still both were walking, in the direction of the faster one. One of the bugs was carrying a dead fly. The fly was bigger than a housefly and the bug held it upside-down so you could see the fly’s brown and yellow striped belly. At first we mistook the fly for a honey bee. 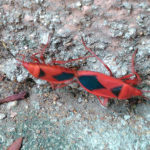 These busy red bugs appear to be scavengers. black ants were rushing around, carrying shiny little white translucent oval things. We made a guess that perhaps the little white ovals were pupae which the ants were hurriedly carrying to a safer place when their home under the pot got disturbed. Ansiya and Rasmi aunties scooped up with a spoon some of the soil along with the ants and their gleaming ovals. We thought we’d watch to see if the pupae hatched into ants. But sadly, in less than half an hour the ants had disappeared leaving behind the pupae, which were now a dull brown, almost the colour of the soil. We have kept the soil in a plastic box, and will watch it for the next few days. * “Spiders produce several types of silk from different types of spinning glands. One type of silk formed by all spiders is the type used for wrapping prey. Another type of silk is used to make the egg sac, and yet other is a sticky type often used as part of a web”.